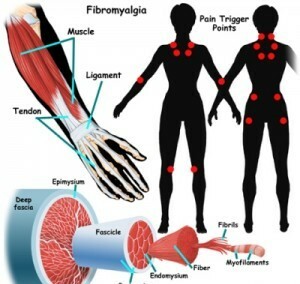 Fibromyalgia (FM) typically presents in young or middle-aged females as persistent widespread pain, stiffness, fatigue, disrupted unrefreshing sleep, and cognitive difficulties, often accompanied by multiple other unexplained symptoms, anxiety and/or depression, and functional impairment of daily living activities. Many physicians still do not accept FM as a discrete illness. However, recent basic and clinical investigations have clarified the neurophysiologic bases for fibromyalgia. This has led to its new classification as a Central Sensitivity Syndrome (CSS). In fact, FM can now be considered a neurosensory disorder characterized, in part, by abnormalities in CNS pain processing. This is a diagnosis made if no spine pathology or other diagnoses can be made with usual diagnostic imaging or laboratory studies. FM is an increasingly recognized chronic pain illness, which is characterized by widespread musculoskeletal aches, pain, and stiffness; soft tissue tenderness; general fatigue, and sleep disturbances. The most common sites of pain include the neck, back, shoulders, pelvic girdle, and hands, but any body part can be involved. FM presents itself in intense, chronic pain that can spread to all parts of the body. Patients also complain of deep aching, numbness, tingling, and a burning sensation. Pain symptoms are often worse in the morning and intensified by cold/humid weather, non-restorative sleep, physical and mental fatigue, excessive physical activity, physical inactivity, and anxiety and stress. FM sufferers also experience extreme fatigue, irritable bowel and bladder, headaches and migraines, restless leg syndrome (periodic limb movement disorder), impaired memory and concentration, skin sensitivities and rashes, dry eyes and mouth, anxiety, depression, ringing in the ears, dizziness, vision problems, Raynaud’s syndrome, neurological symptoms, and impaired coordination. Currently there are no laboratory tests available for diagnosing FM. Doctors must rely on patient histories, self-reported symptoms, a physical examination, and an accurate manual tender point examination. This exam is based on the standardized criteria. Proper implementation of the exam determines the presence of multiple tender points at characteristic locations.The clinical assessment may reveal objective evidence for a discrete illness, such as hypothyroidism, RA, SLE, Polymyalgia rheumatica or another inflammatory or autoimmune disorder. Such findings do not exclude comorbid fibromyalgia. Indeed, approximately 25% of patients with RA and approximately 50% of patients with SLE also have fibromyalgia.